Tom Ryan concluded his sixth season as head coach of the Buckeyes in 2011-12 and the campaign proved to be a historical one. Coaching seven freshmen in the starting lineup, Ryan guided three of them to All-America status, a feat never before accomplished in program history. At the culmination of the season, Ryan witnessed redshirt freshman Logan Stieber capture the 133-pound title at the NCAA championships, marking the third Buckeye under Ryan's tutelage to win an individual national championship. In all, three student-athletes have won four individual NCAA titles as J Jaggers (141 pounds), the 2009 Ohio State Male Athlete of the Year, was a two-time champion in 2008 and 2009. In 2011-12, Ryan, who won his 180th-career match vs. Purdue Jan. 12, and the Scarlet and Gray capped the season with a 5th-place finish at the NCAA Division I Wrestling championships without a single upperclassman in the lineup. Recording a 13-4 overall record and 5-3 ledger in the Big Ten Conference, the Buckeyes beat six ranked teams during the season - No. 15 Virginia Tech, 21-12; No. 9 Pittsburgh, 22-9; No. 20 Kent State, 22-15; No. 2 Iowa, 21-9; No. 12 Michigan, 24-13; No. 8 Nebraska, 21-18 (National Duals). Ohio State also won the annual Cliff Keen Las Vegas Wrestling Invitational where true freshman Hunter Stieber, the younger brother of Logan, recorded a stunning victory over No. 1 and defending national champion Kellen Russell of Michigan, 6-5. Later in the season, the Scarlet and Gray advanced to the regional final of the NWCA/Cliff Keen National Duals Mat Mayhem in Stillwater, Okla. Ohio State faced No. 1 Oklahoma State in the final and dropped a 25-6 decision. Finally, one of the most exciting moments of the season occurred Jan. 20 when the Buckeyes downed Iowa (21-9) for the first time in 46 years (Feb. 12, 1966) before 5,684 fans in St. John Arena. 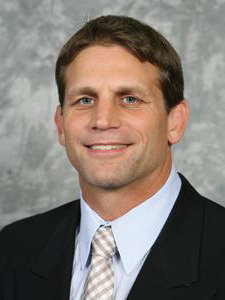 Throughout his tenure as the head coach of Ohio State, Ryan, the 2009 national coach of the year, has maintained a high standard of excellence for his student-athletes. In addition to Stieber and Jaggers' national titles, Mike Pucillo was a 2008 NCAA Champion and while under the guidance of the Wantagh, N.Y., native Lance Palmer (2007-10) became just the second four-time All-American at Ohio State. (Tommy Rowlands was the first). Ryan is averaging about three All-Americans a season having coached 20 selections during his six-year term. Within the Big Ten Conference, Ryan has coached a trio of Buckeyes to league titles in Pucillo (184 pounds in 2008), Palmer (149 pounds 2010) and Stieber (133 pounds in 2012). Academically, Ryan's student-athletes have impressed with six Buckeyes recognized by the National Wrestling Coaches Association with NWCA All-Academic Team accolades - J.D. Bergman, J Jaggers, C.J. Magrum (two-time), Corey Morrison (two-time), Mike Pucillo and Colt Sponseller. Additionally, Sponseller and Ian Paddock were lauded with NWCA Division I True-Freshman All-Academic Team honors. Since Ryan's arrival there have been 26 and 64 Academic All-Big Ten and Ohio State Scholar-Athlete selections, respectively. Ryan's student-athletes also are involved in various community service initiatives. Some of the programs Ohio State is actively involved in include the Second & Seven Foundation, which strives to "Tackle Illiteracy" in Central Ohio and the annual Wrestle against Autism Tournament. In 2009, the Buckeyes were presented with a Resolution of Expression in council chambers from Columbus City Council member A. Troy Miller for their commitment to community service, academics and athletics. After arriving to The Ohio State University campus in the spring of 2006, Ryan immediately began the task of completing his coaching staff. Ryan brought on board some of the best coaching talent in the nation in Joe Heskett, Lou Rosselli and Tommy Rowlands. Two years later, this staff would propel the Scarlet and Gray to the program's best finish in the NCAA championships. Backed by a pair of national champions - Jaggers and Pucillo - for a total of three finalists, Ohio State earned 79 points for the first of consecutive runner-up finishes. The following season, Ryan and Ohio State nearly pulled off one of the biggest upsets in NCAA championship history when three Buckeyes (Reece Humphrey at 133 pounds; Jaggers and Pucillo) advanced to the finals with the team lead. In one of the tightest team races in recent championship history, the Buckeyes were clipped by Iowa by 4.5 points as Ohio State finished with 92 points compared to the Hawkeyes' 96.5. Prior to coaching at Ohio State, Ryan was the head coach at Hofstra from 1995-2006. While with the Pride, Ryan earned Eastern Collegiate Wrestling Association and Colonial Athletic Association Coach of the Year seven times. He also was named New York State Coach of the Year twice. Leading Hofstra to six consecutive conference titles, Ryan and the Pride recorded a 47-match (46-0-1) conference unbeaten streak in dual action which served as the nation's longest conference unbeaten streak. Ryan also was an assistant coach at Indiana from 1992-94. Ryan earned his bachelor's degree in education from Iowa in 1993. He and his wife, Lynette, have four children, Jordan, Jake, Teague and Mackenzie.